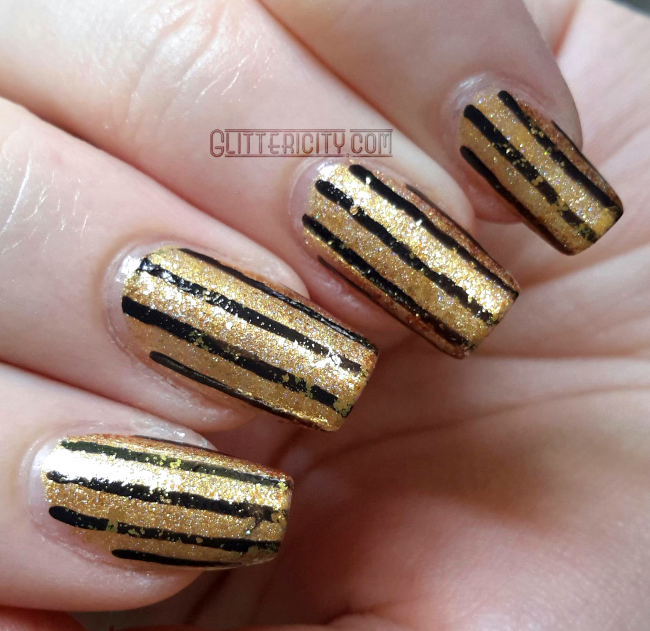 I wanted a holographic gold base for this, and I don't own a holo gold. I do, however, have a holo topcoat I made with INM Northern Lights and a pinch of Spectraflair. It has a silvery tone to it, though, so I knew I'd need to start with a very warm gold so that it would still be gold once I added the topper. OPI Goldeneye fits the bill perfectly, and is still the best gold polish ever ever ever made :D I used three thin coats, and then added my custom holo topper (which I dubbed Rainbowgasm, by the way) and let that dry completely. 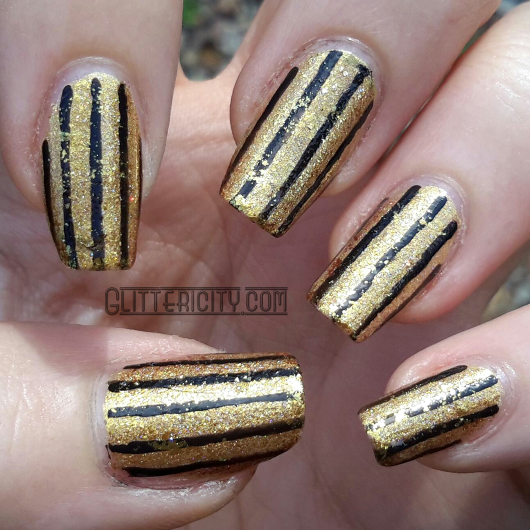 The stripes are painted on with black acrylic paint, a striper brush, and some patience. My secret to getting nice straight lines is using an orange stick dipped into water (or, let's be honest, sometimes I just lick it... #lazy) to gently scrape away any wobbly bits. Since I was going for this worn look, though, I didn't worry about getting them too terribly perfect. The last step really brings the look together. 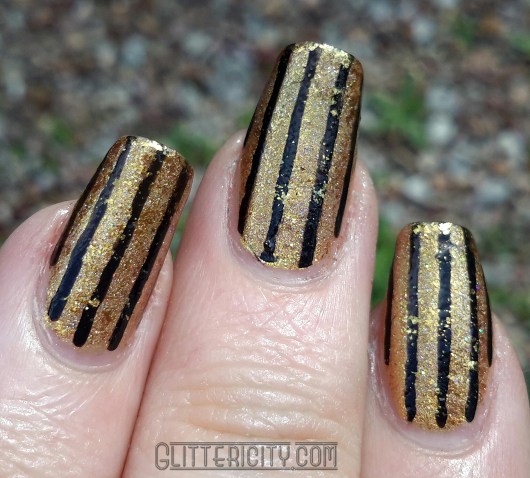 Goldeneye is essentially a flakie polish (albeit a very dense one that covers nicely), so I used a cosmetic sponge to dab on tiny bits of it here and there over the stripes. 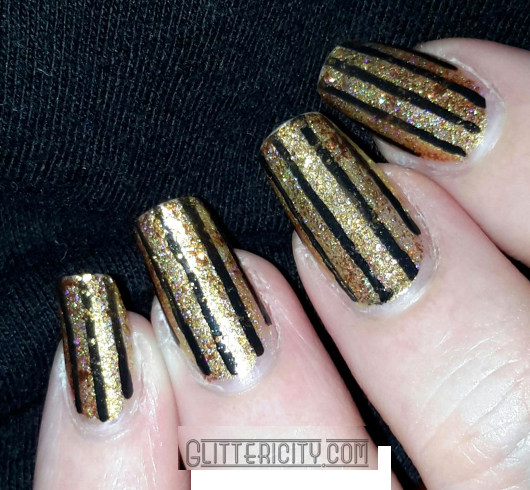 You can see how just a few specks cover the stripes here and there, as well as adding some more of the deep warm gold back into the mix, creating depth. I took this one a bit out of focus, so you can really see the holo bits. It's subtle since I didn't use much of the topcoat, but definitely there.